Ogoma M, Ndanganga PK, Obwoyere G 2014 The birds of Lake Kenyatta, Kenya: a preliminary survey. Bulletin of the African Bird Club 21(2):181-186 . Abstract. The results of the first ornithological survey of Lake Kenyatta, a freshwater lake in Lamu County on the northern Kenyan coast, are presented. A total of 138 bird species belonging to 50 families were recorded. Of these, five species are of global conservation concern, four are regionally threatened, nine are restricted to the East Africa coastal biome and 20% are migratory. The lake and its surroundings are currently threatened by hippopotamus-fishermen conflicts, encroachment for agriculture and settlement, tree cutting, overfishing, invasive aquatic weeds and overgrazing. We recommend further ornithological studies and promotion of ecotourism and capacity building for communities in order for them to manage this important resource sustainably. The authors found 6 weaver species at Lake Kenyatta, between 25 July - 8 August 2011. These were classified as resident, other than the migrant Red-billed Quelea. 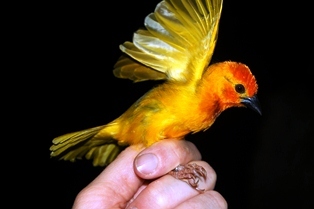 The Golden Palm Weaver was listed as the 7th most common bird species in this study.